Six different layups, once from each side. 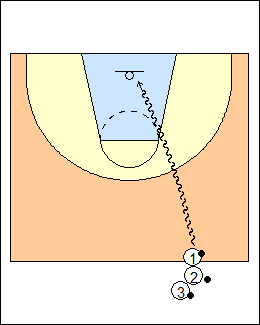 Start just inside the halfcourt line, maximum two dribbles. 1. Regular layup - eyes up, use the glass, no dunking. 2. Reverse layup - from the right side, jump off the left foot, shoot with the right hand, use the backboard (right-foot left-hand from the other side)..
3. Power layup - jump stop, jump off two feet, finish with the outside hand (variation - outside-inside stride stop). 4. Baby hook - dribble with the inside hand, shoot over the front of the rim, jump off the opposite foot. 5. Euro step - right/left from the right side, take the ball over the top into a right-hand layup. 6. Same-foot same-hand - from the right side, jump off the right foot, shoot with the right hand (left-foot left-hand from the other side). See Layups - Villanova, Basketball BC, Kiwi cutting, Cross the lane, Dribbling - 5star triple b, Kevin O'Neill moves.